Previous versions of the Freightliner Argosy truck have looked to bridge the gap between European and American prime movers. Gary Worrall takes the latest iteration for a test drive to see if it continues the tradition. 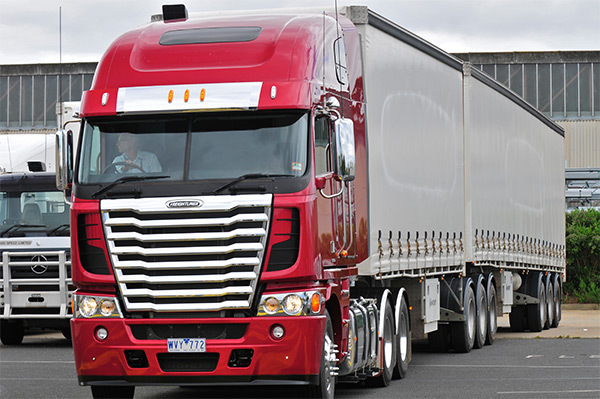 Freightliner’s popular Argosy cab-over prime mover first broke cover at the 2011 Brisbane Truck Show ahead of a full launch at Sydney’s Luna Park. Visually, the new Argosy is distinguished by its massive chrome ‘cheese grater’ grille, which also helps to improve engine airflow, critical for engines dealing with high combustion temperatures as manufacturers chase greater efficiency and reduced fuel consumption. The cab itself is 50mm higher than previously, allowing a single 1,650 square-inch (10,645 square-centimetre) radiator, doing away with the previous model’s supplementary radiators. This also allows the new Argosy to be fitted with swing-out steps for both the driver and passenger, making it one of the safest cab-over designs for occupant entry and exit. While earlier models had problems with the swing-out stairs, Freightliner manager Gary Wheatley says these have been addressed in the new version. The development of the stairs has had advantages, Wheatley says, with government agencies citing the design as an example of safe work practice for the transport industry. The new version benefits from a subtle redesign that focused attention on detail changes, such as reducing panel gaps, eliminating the quarter vents and generally looking for the ‘1 percent’ items that improve the driver’s work space. The cab is now ECE R29-compliant, meaning it has passed the same rigorous crash testing standards as its brethren wearing the three-pointed star, although Wheatley says it is not a badge-engineered Benz but a genuinely Australian truck. 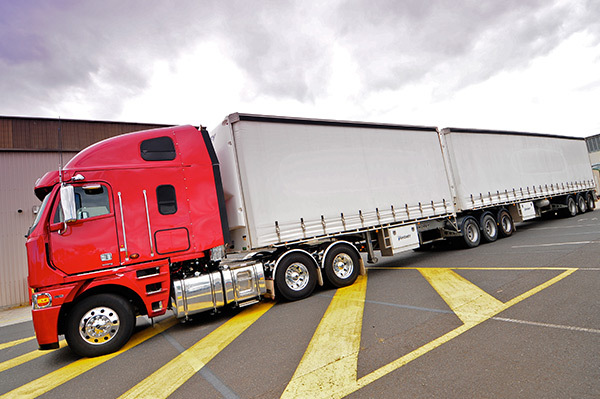 "The Argosy is primarily built for Australia, it is not sold in North America at all, they do not take cab-over product, but it does also go to some smaller markets." Despite taking the safety lead with cab design, there is a degree of resistance to active safety technology in the industry, particularly among buyers of North American trucks. "We do have safety technology available, but the problem is getting customers to accept it," Wheatley says. Regardless of this, the Argosy is offered with Bendix disc brakes and Wabco ABS, as well as traction control. 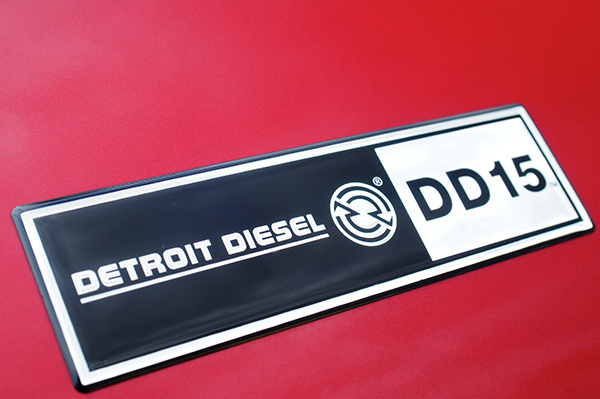 Wheatley says the 16-litre Detroit Diesel engine is scheduled to undergo 1 million kilometres of testing ahead of its introduction when Australia adopts ADR 80/04 rules, to ensure all areas of operation, including durability and cooling, are fully sorted. While Freightliner will not have an in-house 16-litre option before 2015, Wheatley says he is not concerned by the imminent release of the MP10-powered Mack Titan and Super Liner models despite them offering up to 685hp. "We are not worried about the MP10 option, there is always someone pushing the boundaries [of power] but horsepower costs fuel." The current Argosy 6x4 prime mover has a Detroit Diesel DD15 14.8-litre in-line six cylinder. The DD15 offers 418kW of power at 1,800rpm and 2,510Nm of torque at 1,100rpm. Along with the choice of a full manual Road Ranger 18-speed transmission, the Freightliner Argosy has the option of an Eaton Ultra Shift Plus automated manual. "The Ultra Shift Plus models will arrive in 2012, we currently have a couple of test trucks fitted with Eaton’s Auto Shift three pedal AMT, but they are for development only with the upcoming DD16 and Cummins ISX engines," Gary Wheatley says. As with the exterior, much of the latest Argosy is familiar territory, operators need not fear driver confusion switching between the previous and current offerings. 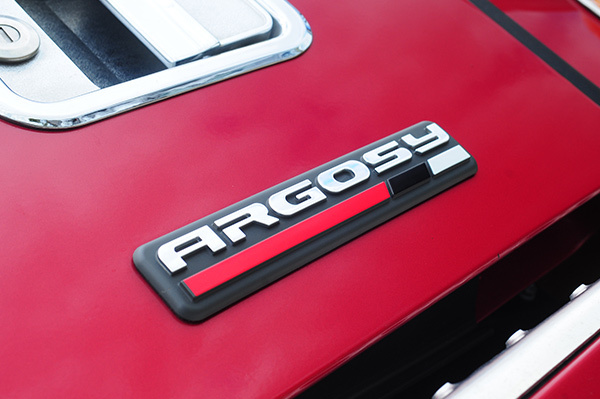 The Argosy dash has always been a compromise between the North American ‘gauge for everything’ and the European ‘keep the display simple’ philosophies, and this continues with the new model. Dials provide information on speed, engine revolutions, temperature, air pressures and fuel levels, with other readouts available via the programmable central display. Driver distraction is minimised, meaning more time is spent watching the road, not the dash, making the driving task safer for everyone. Freightliner fans will rejoice at the retention of the familiar yellow and red park brake buttons, despite not being to everyone’s tastes they are popular and retain the sense of the familiar about the cab. What is new is the flat floor, making in-cab movements easier, particularly if the double bunk option is exercised and drivers switch seats without leaving the cab, such as in cold, wet or dusty locations. The other good news for two-up operations is the improved foot room on the passenger side. Anyone who remembers being wedged into the left seat of an early Argosy will be especially grateful. Improvements to the cab sealing means the air-conditioning works well, having tested new design product in both hot and cold conditions the driver can pick a temperature and enjoy genuine climate control. As one of apparently above-average height, the one serious complaint is the lack of rearward adjustment for the seats, while this can apparently be rectified by reversing the asymmetrical seat base, an Australian seat for Australian drivers would be a better option. The seat itself is also a bone of contention, where competing brands — whether Japanese, European or American — offer air suspension seats with integrated seat belts, Freightliner persists with a B-Pillar mounted restraint. Despite the improved cab suspension, big shocks still make it upstairs and trigger the seat movement but the solidly anchored seatbelt then restricts the driver as the seat moves under them. Just like Willie Nelson, the Argosy is happy to be on the road, the test truck was a 34-pallet B-double configuration grossing approximately 60 tonnes, enough to test the Detroit Diesel DD15 but well shy of its 106-tonne GCM. The improved cab insulation means closing the door can be a real effort, the trick is to crack window open a fraction to let the air pressure out so the door closes cleanly. Starting the engine is the next exhibition of the improved cab. Despite sitting on top of the 15-litre inline six cylinder there is no heat or smell in the cab, and engine noise is literally a dull roar from somewhere below and behind. This is good news for the sleeper cab — with no heat coming up through the floor, it is possible to get a proper rest while not driving. While the production trucks will use the two-pedal Ultra Shift Plus, the test rig retains the three-pedal version, so that the driver needs to use the clutch when starting or stopping. Despite this, removing the gear shift and linkages from the cab has eliminated the bulk of the noise and vibrations, so that driving is a pleasant experience. While the transmission lacks the overall refinement of European AMTs, it is effective and accurate, with no missed gears and only minimal ‘hunting’ up and down the ratios. Like all AMTs, the transmission is ‘blind’, that is it cannot see what the road conditions are ahead of the truck, whether it is hills or valleys, or traffic jams, so that the human element is essential for preparing the truck for changing situations. For this reason the transmission features full manual functionality, with the driver able to shift up or down as required and also lock the transmission into specific gears, such as low gears for steep descents. Freightliner has also worked to smooth the steering, while the Argosy only uses a single steering box, rather than the twin boxes of the Century class models, eliminating much of the vagueness at the dead ahead position. This also translates to improved steering response, while the axle forward design provides a wide range of movement, including tight ‘S’ bends through small country towns not originally designed for modern truck operations, such as Frederickton on the Brisbane-Sydney run. The DD15 is a willing performer, with more than 2,300Nm of torque available at 1,100rpm the engine lugs hard all the way through to the peak power of 418kW arriving at 1,800rpm. Cruising at 100km/h saw the engine running at around 1,500rpm, so that not only was there power in reserve but the engine was also operating at its most fuel efficient. Even when working hard the engine noise remains a sonic backdrop, with two people in cab talking or listening to the radio there is no risk of being overpowered by the driveline. The only exception is when the 11-blade Horton fan kicks in, however in normal driving this is unlikely to happen too frequently. On our test loop between Melbourne and Leongatha the fan cut in four times, averaging 25 seconds each time, with the fan engaging at 108C and then switching off again when the temperature dropped to 97C. In normal highway and stop-start traffic driving, the fan remained silent. It was only on the steeper ascents up to Leongatha that it made its presence known. The Argosy is fitted with cruise control and a hill-start assistant to make the driver’s life easier. The hill start holds the brakes while the clutch engages, eliminating roll-backs and reducing driveline stress from over-revving on take-off. The DD15 is fitted with a three-stage Jacobs brake that provides plenty of stopping power. 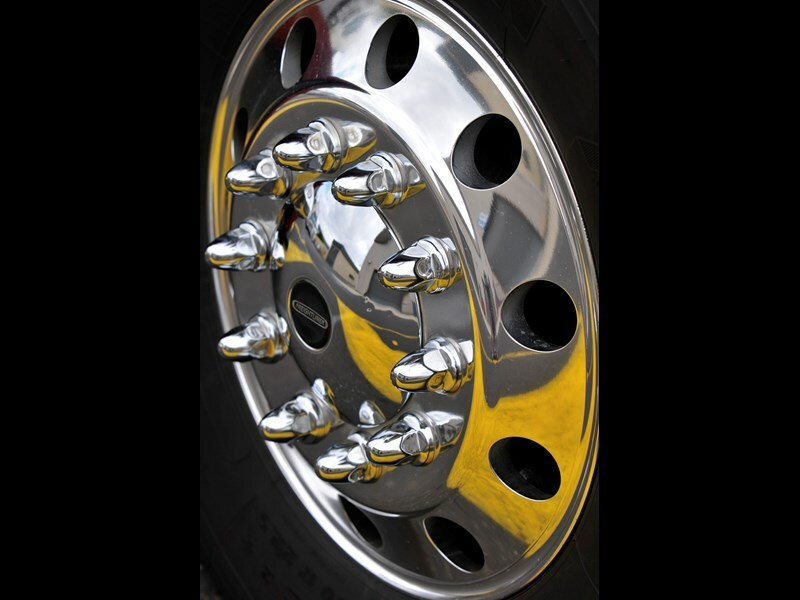 Combined with the disc brake of the Argosy, it means emergency braking situations can be handled confidently. Unlike hydraulic retarders favoured by European manufacturers, the Jacobs has a distinctive bark. Although muffled by the improved noise proofing it is still clearly audible in the cabin, but not to the extent of older models. Without doubt, the revised Freightliner Argosy represents a significant step forward from the previous model; no mean feat given the ‘Evolution’ was a well-executed cab-over model with plenty of refinement. However the improved design and build quality of the new model lifts the bar even further, especially in terms of driver comforts, with draughts and dust now a thing of the past. Wheatley says plenty of work went into redesigning the cab, including improved door seals, removing the quarter vents and installing a flat floor, as well as improved sound and heat proofing in the cab floor. Add to that the introduction of automated manual transmissions, which remove the mechanical connection between the cab and the driveline, and in-cab noise and vibration are significantly reduced, all of which adds up to a smoother and less-tiring ride for the driver. Unfortunately, the Argosy remains a work in progress, with seemingly little things like non-integrated seatbelts for the driver’s suspension seat causing, ahhh, discomfort shall we say, as the seat moves independently of the seat belt bolted to the B-Pillar at the rear of the cab. Taller drivers will also find leg room restricted by the seat fore and aft movement, while the seat itself lacks the shock absorbency of competing models. Overall though, the new Argosy with the ‘family’ DD15 engine and the soon-to-arrive Eaton Ultra Shift Plus is a refined ride in a segment previously renowned for average NVH levels, and should attract plenty of attention from operators.